RUSH: There is another story out there that CNN just can’t drop. They’re focused on this. I mean, they’re glued to it. Somebody needs to help me understand why. The story is that Jared Kushner’s clearance has been downgraded. He’s Trump’s son-in-law, married to the lovely and gracious and very tall Ivanka. Do you know how tall Ivanka is? Six feet. She’s a very tall woman. Yeah. Well, now that you know this, take a look at some pictures of her with the ChiCom guys and with the South Koreans. Just take a look at it. It doesn’t matter. She still wears the heels. She towers over these people. At any rate, could anybody explain to me…? I mean, they didn’t give a rat’s rear end about Hillary Clinton sending all kinds of classified data all over the world from her unprotected email server. They tried to tell us it was no big deal because Hillary didn’t intend to do anything wrong. She is trafficking in classified data. Obama knows it and is also doing the same thing. American secrets are being sent all over the world unsecured via Hillary Clinton’s email, and they tell us no big deal. Now, Jared Kushner — who is a senior foreign policy adviser, some the kind of adviser, Trump’s son-in-law — has had his clearance downgraded, and the media’s acting like it’s one of the biggest victories they have secured in their entire war on Trump. Now, look… (interruption) No, no, no, no. I’m not naive. I understand in the sense that they have been demanding it and Kushner doesn’t know what he’s doing and he’s there only because he’s married to the first daughter and all that. Any harm or any loss of power, shall we say, to anybody in the Trump team is a big deal. But what is the big deal? Why is this worth 75% of CNN’s news wheel? Somebody gonna have to help me out. I also ladies and gen… (interruption) No, I’m serious. I understand it at the root level. But why it’s worth so much coverage? It was the chief of staff that did it. That may be a factor. The chief of staff, John Kelly, basically cut Jared Kushner off at, what, the ankles? I don’t know what percentage. I think the highest level of clearance he has is for “secret” documents. He’s not now entitled to see “top secret” or anything of even greater security or secrecy than that. RUSH: I wanted to find out why the attack on Jared Kushner. I mentioned in the last hour, CNN cannot let go of this. CNN is acting like they have just scored a major win in this all-out effort to stop Trump because the chief of staff, John Kelly, has reduced Jared Kushner’s security clearance. He didn’t have the highest clearance, but he had a fairly good, high clearance. He was able to see top secret, I think one level above. But now he’s been chopped down to size, and the only security clearance he has is for secret documents. And CNN’s acting like this is the greatest day that they’ve had yet. I mean, they’re celebrating this. I said, “Why? What’s the big deal? Jared Kushner’s not that –” He’s the son-in-law and so forth. So I decided, ladies and gentlemen, during the break to do some digging, and I found what might be some reasons for this in the Washington Post. A copy-and-paste sentence. “According to current and former officials familiar with,” who cannot speak because they are not authorized to do so. So we don’t know who the sources are again. 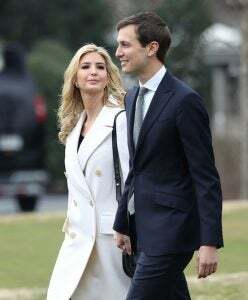 “Among those nations discussing ways to influence Kushner to their advantage were the United Arab Emirates, China, Israel and Mexico,” according to the current and former unnamed, anonymous sources. “It is unclear,” writes the Washington Post, “if any of those countries acted,” on any of this. Meaning, there’s really no need for us to write this story, ’cause we don’t know that anything has ever really happened. We don’t know that these countries have ever really tried to leverage Jared Kushner. We are just told by four or five people from the deep state that they could. We don’t know that it’s happened, but since it could happen and it’s really bad if it does happen, we’re gonna write it as though it will happen, and it’s gotta stop. So we are to conclude here that the one adult in the White House, the chief of staff, John Kelly, thinks that Kushner is a kid, out of his league, doesn’t know what he’s doing, is a Lucky Sperm Club member, got his dad, money, and businesses in the media and real estate, and this guy’s running around making deals with foreign countries in the Middle East, and we can’t have this. That’s the story. Yes. It’s the White House, the Trump White House that’s decided that Jared here doesn’t know what he’s doing enough to get a top secret clearance. So Jared’s obviously working on something, and it might be something that might be on the verge of succeeding. Can’t have that, folks. Trump cannot succeed. When it can be stopped, it must. So we have a story with every bit as much leaking as there has been on the Russian collusion story now on Jared Kushner about a White House that thinks he’s such a grave threat. And he’s so exposed to blackmail that the White House had to cut his security clearance, so he only can see secret stuff. Meaning he can’t see the real top secret stuff so that our enemies can’t torture it out of him. Blah, blah, blah, blah, blah. No evidence, no named sources, no nothing. But five reporters to report this. RUSH: Here. Look at this. Just to give you an idea, remember when George W. Bush’s approval number descended to the thirties and Wolf Blitzer did a breaking news announcement every 10 minutes of it? (imitating Blitzer) “I’m Wolf Blitzer at CNN, breaking news, breaking news, it’s 1 o’clock in the East Coast, it’s 4 o’clock in the West Coast, and it’s 9 o’clock in Riyadh or whatever, and George Bush’s approval numbers are at 38%. Hi, Wolf Blitzer, it’s the 2 o’clock eastern, it’s 5 o’clock in London, wherever else, George Bush is in the tank.” Remember that? Well, they’re doing it again with Jared Kushner and his security clearance! Here is an example. BLITZER: Hello, I’m Wolf Blitzer. It’s 1 p.m. here in Washington. Wherever you’re watching from around the world, thanks very much for joining us. A set of bombshells rocking the White House just the past 24 hours. The president’s son-in-law stripped from seeing America’s top secrets as other countries look to exploit him. RUSH: Man, oh, man. You see? So Jared was running around, and he had too much clearance. I mean, he was supposed to too many secrets, and because the guy is whatever he is, it makes him ripe for leverage and blackmail, and so somebody in the White House decided that Jared — And they can’t blame it on Bannon, ’cause Bannon isn’t there anymore. So they’re blaming it on John Kelly, the adult in the White House. You know, I don’t know much at all about this whole security clearance system, but I’ll betcha people have their clearances changed frequently. And I’ll bet you sometimes it’s done publicly like this just to get people to leave other people alone. They’re making so much out of this, it’s just typical. They’ve lost their minds at CNN.